Three days later, I’m still in the midst of mentally unpacking those five days on the trail – all that they were and are for me, all that they meant and mean to me. This whole unpacking thing? It’s messy. Frustratingly so at times. It’s a process that takes time. I tend to go deep – I can’t seem to help it – and so, this process can be brutal. There are certainly highs, when myself and my “inner team” are dancing in near-perfect coordination, when we’re in flow together. But for all the highs, there are also plenty of “lows,” moments when my inner team and I are duking it out – a gritty, down-and-dirty fist fight in the ring that is my mind where the next jab can, and will, come from any angle. Yet as frustrating as this unpacking process can be – recognizing the ways in which I have stretched, grown, owe honest moments to myself and thus will never be the same – I also know triumph, joy and ahas are part of that process. There is heartbreak; there are breakthroughs. It’s all part of the deal. Some is foreseen. But most is more than I can or could ever anticipate. I simultaneously love and hate that for the challenges and growth it forces. Time immersed in nature. It is intense, intimate, honest, raw and real. It’s one of the best gifts and grandest experiences this planet has to offer. It’s not always pretty – a metaphor within and beyond this unpacking process. But I’ll gladly take the tough times with the good ones because, with nature on my side, I like to think the good wins. Always. Hay muchas ganas con naturaleza. Siempre. I’ve been writing A LOT both during my time in Torres del Paine and after, and while a lot of it is for me, there’s still plenty more to share. When it comes to this experience, this is only the tip of the iceberg. There’s so much more unpacking to be done. The photo above is from the start of our second day on the trail. 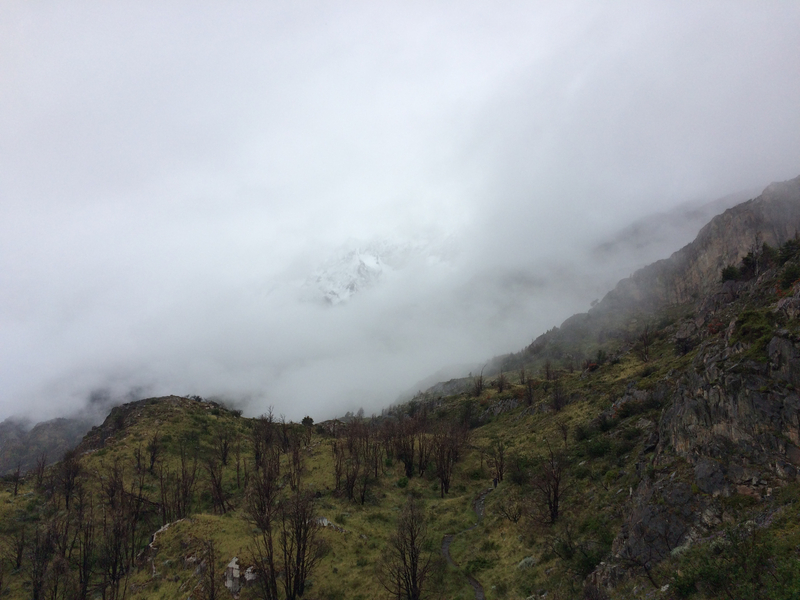 It certainly doesn’t depict the most obviously stunning landscape we saw, but there’s something mystical about this image that really strikes me as capturing the essence of Patagonia – and its ever-changing weather, which I’d say we got a solid taste of throughout our trek.